I recently had dinner at a friend’s house and found myself in love with a delicate and strong flavor in the salad she served. What was it? Shiso, also known as Japanese basil, is a member of the mint family. Shiso has large teardrop-shaped leaves with jagged edges. Its flavor is hard to place. It brings to mind basil, mint, cilantro and citrus. However, shiso’s flavor is truly its own. You have to try it yourself to understand the taste of shiso. A perennial plant that is often cultivated as an annual plant in our temperate climate, shiso has purple-red or green leaves. In Japan the purple-red leaves are used to color pickled plumbs or umeboshi. They give the plumbs a bright red color from their reaction to vinegar brine. Shiso is also eaten in Japan with sashimi, as a pickle and as a condiment for cold noodles. Shiso complements all kinds of dishes from green salad to meat and seafood. Add it to a stir-fry, on top of vegetarian or meat tacos or sprinkle it on cooked meat or tofu. You can find shiso in bundles at the Midori Farm booth this week at the Port Townsend Saturday and Wednesday Farmers Markets. Midori has both red and green shiso. Farmers, Marko Colby and Hanako Myers, recommend shiso chopped finely in raw cucumber or turnip salads with sesame oil and ume plum or rice vinegar. They also love to add it to any rice dish, sushi or nori rolls, fish, sauerkraut, dill pickles, and in a basil- shiso pesto. Yum! Things to look forward to this week include: eggplants that look like they are ready to meet you (see photo below) grown by SpringRain Farm and Orchard, apples and pears from Finnriver Farm, abundant strawberries from Red Dog Farm, local corn and melons from Onatrue Farm, beautiful flowers from Green Gables, Amie's Garden, Serendipity and many of our other local farms, green beans, cucumbers, tomatoes, summer squash, seasonal chevre from Mystery Bay Farm and so much more! 8/24: Steve Grandinetti, 2pm to 6pm, PT Wednesday Farmers Market, Polk St.
8/27: The Olympic Trombone Orchestra, 10am to 1:45pm, PT Saturday Farmers Market, Tyler St.
9/14: Closing day of the PT Wednesday Farmers Market, 2pm to 6pm, Polk St.
9/17: Tomato Taste Off, 9am to 2pm, PT Saturday Farmers Market, Tyler St. Artist, Shirley Moss, the Chainmaker, is a new vendor to the PT Saturday Farmers Market this season. Shirley, originally from Michigan, started making jewelry as a high school student at age 16. Her love for the craft grew into her profession of the last 45 years. Shirley hand-makes intricate sterling silver and gold chains, earrings and other jewelry available the PT Saturday Farmers Market and the Port Townsend Gallery. 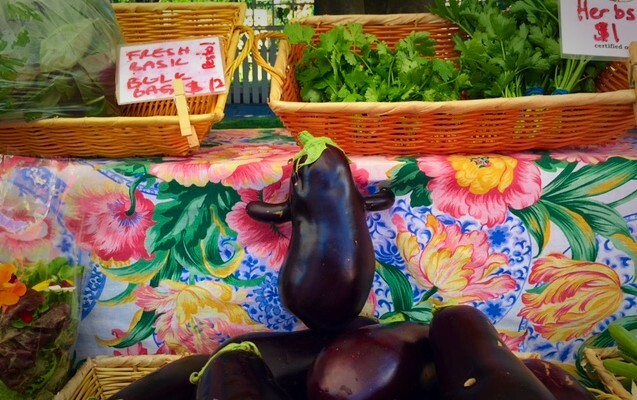 Shirley is thrilled to vend at the PT Saturday Farmers Market this year. She loves the community of vendors and market patrons. Furthermore, vending at the market allows Shirley to earn a living from her art. This, in turn, supports Shirley’s continued volunteer work as the full-time Manager of the Port Townsend Food Bank. Shirley and her partner, Greg Root, started dating 45 years ago. They are, to this day, the loves of each other’s lives. Greg is a helicopter pilot and sailor. It was his interest in living close to the water that brought Greg and Shirley to Port Townsend from Ashland, OR in 1994. At age 41, Shirley had heart surgery to repair a hole in her heart, which she had since birth. During the surgery, the surgeon accidentally cut her atrioventricular (AV) node, the electrical conduction system for the heart. Shirley died and was resuscitated on the operating table. The surgeon installed a pacemaker in her chest to replace the function of the AV node. As she healed from surgery and adjusted to living with a pacemaker, Shirley felt like she had aged 20 years overnight. She was tired, out of breath and found herself empathizing deeply with elderly adults. From this place of empathy, Shirley started bringing food donations to low-income senior citizens five days a week. She collected food from QFC and delivered it to seniors at the Marine Plaza apartments in downtown Port Townsend. In 1997, Shirley took this work further, becoming the volunteer Assistant Manager of the Port Townsend Food Bank. In 2010, she became the Port Townsend Food Bank Manager, a full-time, seven-day-a-week job. 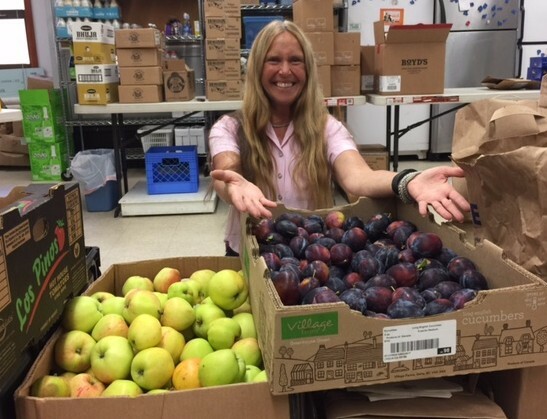 Shirley has a deep personal commitment and love for her work with the Port Townsend Food Bank. Shirley was selected as the 2012 Port Townsend Citizen of the Year for her immense commitment to community service. This year she received a Life Time Achievement Award from President Obama for more than 4,000 volunteer service hours given to the community. She has actually given twice that many hours as the Manager of the Port Townsend Food Bank. Read the recent Port Townsend Leader article for more information about her Life Time Achievement Award. We have a generous gem at the PT Saturday Farmers Market, weaving silver and gold into chain. Introduce yourself to Shirley Moss at the PT Saturday Farmers Market or at the Port Townsend Food Bank. 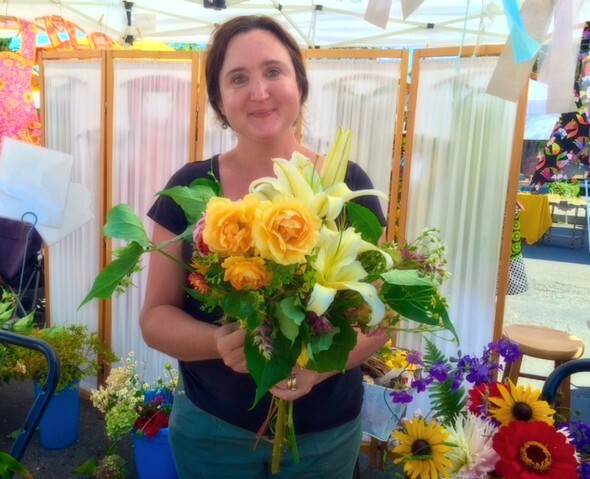 You can find Shirley back-to-back with artist, Kim Thomson, in the center row of the Farmers Market each Saturday. SpringRain Farm and Orchard has terrific pasture-raised organic fresh chicken this week. They are delightfully tasty, and whole birds are a great value. Meghan has put together some creative ways to get three meals from one bird. Here is one of her sets of recipes for chicken curry soup, chicken salad, and chicken stir-fry. Or try her chicken enchiladas, tacos, and tomato soup, perfect with heirloom tomatoes. SpringRain also has frozen organic duck and forage-fed rabbit available for a limited time. This week Midori Farm will have shiso, basil bunches, shishito peppers, eggplants, lots of tomatoes and fresh shelling beans. Serendipity Farm has lots of yellow and green Romano beans, Anaheim chilies, eggplants, turnips, salad greens, beets, wonderful summer salad mix, tomatoes, a full array of salad dressings, pesto, fresh salsas, vegan gluten free treats and beautiful fresh summer bouquets. Nash's Farm: Get your green beans here! This veggie of the week is excellent raw and a crunchy sweet addition to a veggie platter or salad. With the weather a little cooler this week, pick up a few pounds for pickling or canning. Nash's has dill flowers as well for those simple summer dilly bean recipes. Nash's is also bringing you carrots, heirloom and slicing tomatoes, basil (only a week or two left of basil harvest for you pesto makers). Coming down the pike are Walla Walla onions, leeks, kale, chard, pickling and slicing cucumbers and all sorts of beets. Arms full from all these fresh goodies? Pick up a Nash's locally designed and screen printed organic cotton tote bag. Propolis Brewing has new late summer releases: Litha, Melissa, Granum and Wyrt. Litha is a Golden Saison brewed with spelt, chamomile, lavender and sage. Melissa is a Golden Saison brewed with lemon balm. Granum ia a 5-grain herbal Saison Brett and Wyrt is a Farmhouse Stout. Visit Piper at the Propolis booth for a taste and to learn more about food pairings for these tasty brews. Red Dog Farm is bringing tons of cauliflower! Super white, beautiful heads have exploded in our fields from all the hot weather last week. Time to roast, mash, pickle, etc. Also, we still have loads of strawberries, beans, basil, tomatoes and other goodies.